Among 38 of the world’s more developed nations, the United States has the least liberal government policies regarding paid parental leave, leading some to argue that this puts American women at a disadvantage as they navigate their careers. But it also turns out that some countries that offer more liberal parental leave policies have higher pay gaps among men and women ages 30 to 34, according to analyses of 16 countries conducted by the Organization for Economic Cooperation and Development. 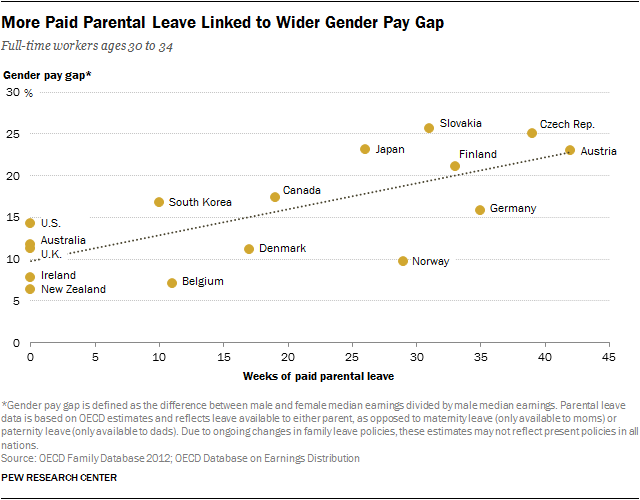 OECD theorizes that this link may be driven by the fact that women are more likely than men to actually use their parental leave, and that time out of the workforce is associated with lower wages. The hourly pay gap in the U.S. is now 16%, according to a recent Pew Research Center report on gender and work – meaning that women today earn 84 cents for every $1 a man earns in an hour. This gap remains persistent, but has shrunk markedly from 36% in 1980. Using a slightly different metric, the OECD found that the pay gap in the U.S. was about 18%, slightly higher than the median pay gap across 26 OECD states, which was about 14%. But parental leave and gender differences in work experience are not the only factors associated with the gender pay gap. As is the case in the U.S., across these other 25 countries the gap increases with age, and with parenthood. As in the U.S., women in most of these countries have more education than men; this reduces the pay gap to some extent. It’s difficult to know the extent to which other factors may be driving the pay gap. What is clear is that among majorities in several developed nations, there is a perception that women are at a disadvantage when it comes to job opportunities. 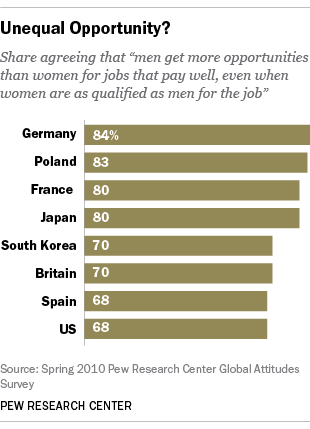 In 2010, Pew Research surveyed publics in a number of countries, seven of which are also represented in this pay gap data, about whether “men get more opportunities than women for jobs that pay well, even when women are as qualified as men for the job.” Majorities in all seven countries agreed with the statement. Agreement ranged from about seven-in-ten in the U.S. and Spain (68%), and up to more than eight-in-ten in Poland (83%) and Germany (84%).